The Better Back Program performed on a consistent basis over a period of time will stabilize and strengthen the back. This program utilizes several pieces of exercise and rehabilitation equipment that is lightweight and transportable. The equipment recommended by the Better Back Program is used by doctors of chiropractic, physical therapists, and other healthcare professionals and have stood the test of time for reliability. The round surfaces of the Gym Ball also call a fitness or Swiss ball provides an unstable (labile) surface which lends to a wide variety of activities geared to strengthen, tone, and build endurance to the stomach, back, hips, and leg musculature. In addition to strength gains, the Gym Ball will increase coordination, flexibility, balance, improve posture, and body awareness. All of these attributes are essential to obtaining and maintaining a healthy back. Muscles strengthen quickly with regular usage of the Gym Ball. This is due to the added effect of balancing on the ball during exercise. Balancing during exercise utilizes the eccentric component of muscle contraction. While balancing on the Gym Ball, the muscles elongate while contracting. This is called eccentric contraction. For example, eccentric contraction comes into play when slowly lowering a weight after the arm has flexed during a biceps curl. 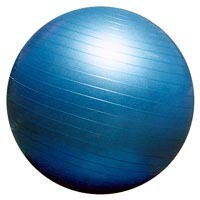 Additionally, the activities performed on the Gym Ball are low impact, placing minimal stress on joints. The Gym Ball is lightweight and can be used at home, at work, or while traveling. There will never be an excuse to miss a workout with the Better Back Program. In addition, the Gym Balls recommended (see index at the back of this book) are very durable and can support up to 600 pounds! With proper care, the ball will last many years. Which Gym Ball Is Right For You? Prior to Inflation -- The excitement will mount as the new Gym Ball is removed from its' storage box. Hold on! For best results, make sure the ball has reached room temperature before inflation. Inflating the Gym Ball -- There are many ways to inflate the Gym Ball. There are hand held pumps, foot pumps, raft and mattress pumps. An air compressor with a trigger nozzle adapter is the easiest way to inflate the exercise ball. There are various pumps recommended at the end of this book (see index) that are designed specifically for the inflation of Gym Balls. When filling the Gym Ball with air do not over inflate it! Over inflation will make many of the exercises and balancing on the ball very difficult and can lead to injury. Slight under inflation will not affect the performance of the ball. For proper inflation determine the size ball you are about to fill. The size is generally marked near the fill-hole or along the equator of the ball. Use the chart below to determine how big the ball should be. For example, a 65 cm ball will be 25.5" tall when properly inflated. Measure on a wall from the floor to the recommended height of the ball. Inflate the ball until the crown of the Gym Ball reaches the measured point on the wall. To clean the gym ball -- use soap and water. Be sure to get all the soap residue off while drying. 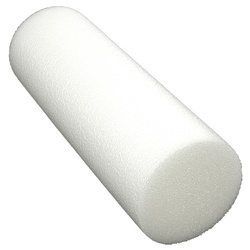 Foam rollers are cylindrical tubes; as the name suggests, made of closed cell foam. Like the Gym Ball, foam rollers are lightweight, transportable, easy to set up, and safe to use. Many of the benefits derived from the use of the Gym Ball such as increased flexibility, balance, strength, and body awareness carry over to the foam roller. Caring for the Foam Roller -- the foam roller is made of a specific type of material called Ethafoam which is very strong and durable. The manufacturer claims that the roller can hold over three hundred pounds. Clean up is easy, simply use soap and water. Exercising with elastic tubing will increase muscle speed, strength, and endurance. As with any specific movement, these exercises can generate an increase in circulation, including venous and lymphatic drainage. Caring for the Elastic Therapy Tubing -- Elastic exercise equipment can cause serious injury when not used properly. Do not use the tubing in any manner that may cause it to snap toward the head and eyes. Regularly examine the therapy tubing for nicks, small tears, or punctures that may cause the tube to break. If any defects are discovered in the elastic tubing upon inspection, discard the product and replace with a new one. 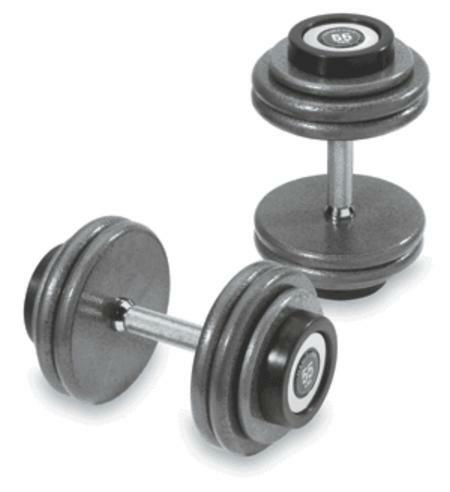 Dumbbell can be fited weight or interchangable weights. 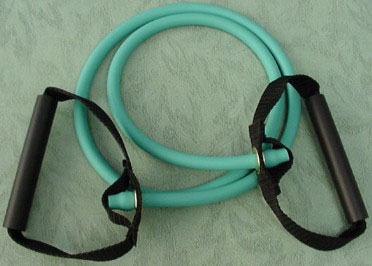 Many of the elastic tubing exercises found on this site can be performed with dumbbells. For the purpose of rehabilitation it is better to have lighter weights which can be controlled and used to perform multiple repetitions.